Being a family of international jet setters, this year my family wasn’t together to celebrate Father’s Day together. My dad is an one of a kind dad, truly special and puts up with a lot of cheek from me and my brother. We have many names for both our parent’s that have developed over the years from childhood, not necessarily the usual. Papa Roach, Van Papan Speil and the main one that has stuck the longest. Captain Oddball. Not totally sure where it came from, I think that my mum plans event’s to military precision that she is called Hawk. Dad is Captain Oddball to her Hawk. To celebrate Captain Oddball’s Day with the whole family, we planned a weekend after the date when the sun was shining and the Lions won the series. We spent the day playing croquet in my parents beautiful garden before getting dressed to try a new restaurant in Cheltenham, near where I used to work as a student. Purslane opened last summer and I’ve been hearing really good things about it so was excited that we booked a table with them. One of the many reasons I love my family is that they are always up for trying a new restaurant or dish. AND they share so I don’t get a bad case of food envy. The menu reads like a dream, using the best sustainably caught British fish and Cotswold ingredients, I had a hard time to decide what I wanted. Which is a very good sign if I struggle. 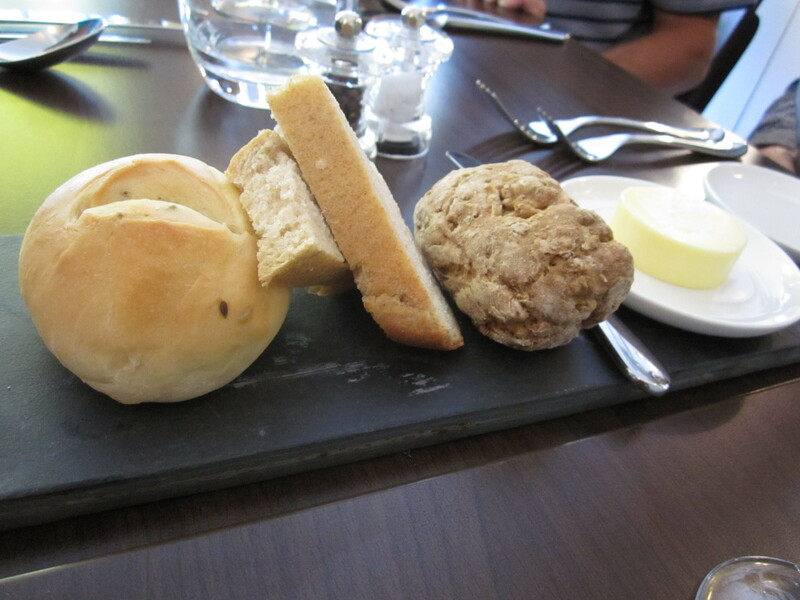 Starting with warm home made bread and and icy chilled glass of fino, we all poured over the menu. My choices were actually quite unusual for me in that I went for a veggie main course. As you can tell from my posts I normally use eating out as an excuse to gorge on meaty treats but with the weather being so warm I went for something a lot lighter. Also the desserts looked immense. 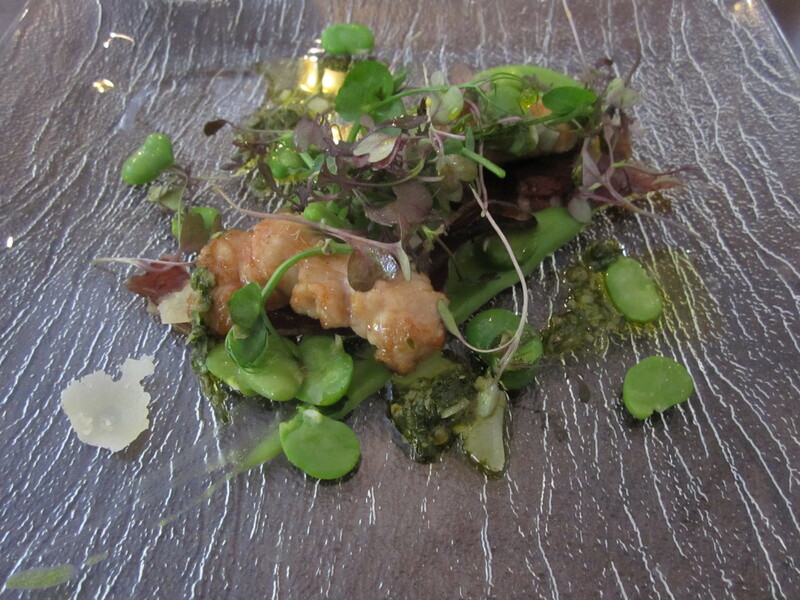 I went for the lamb sweetbreads cooked in hay, broad beans, hogget ham, salsa verde. People get freaked out about sweetbreads. Google them if you don’t know what they are. The lamb was delicately perfumed with the sweetness from the hay and the richness cut through with the salsa verde and broad beans. This might be a bit weird but I liked how the glass plate had been warmed, I think the dish needed it and allowed the ham to warm and come alive. 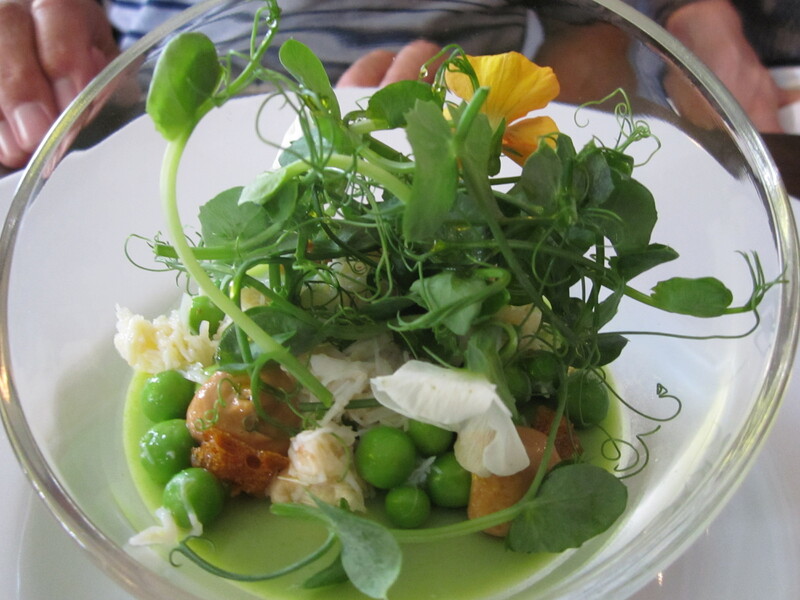 The rest of my party went for the Salcombe Bay crab, pea mousse, paprika honeycomb, shoots and flowers for their starter. The crab was fresh and light nestled amongst the vibrant mousse. With nuggets of paprika honeycomb to add texture to the dish, I think I’m in love with the idea of a savoury honeycomb. Another beautifully dressed plate but with substance to back you the design. For my lighter main course, I went for the Cerney goat’s curd, courgette flower tempura and Broadway tomatoes. 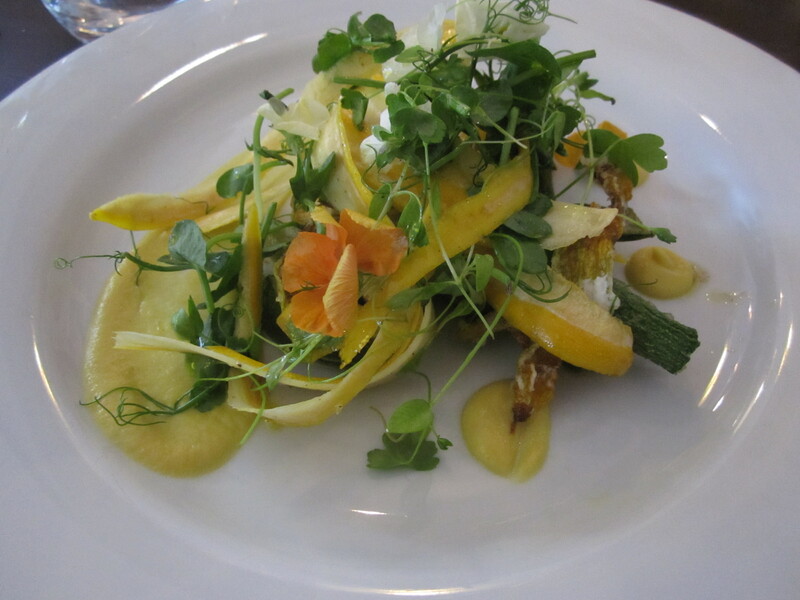 I love courgettes and the mixture of the fresh yellow courgettes and the crispy tempura was fantastic. The goats’ curd used as the filling for the flowers was light and creamy and full of flavour. Can’t say I noticed any of the tomato but was still filling for a light fresh dish. 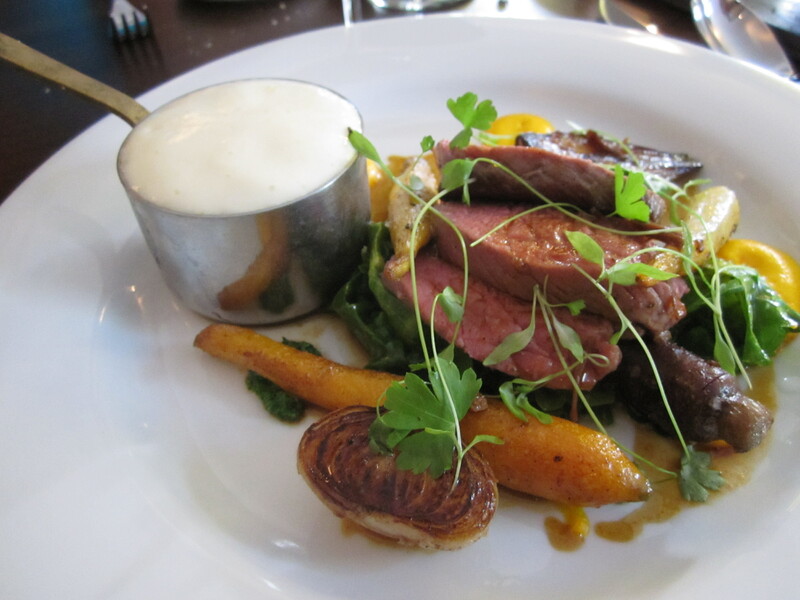 Captain Oddball went for the amazing sounding Sirloin of Somerset beef, carrots and black cabbage and ox cheek pie. When picking the restaurant, me and my bro knew this would be the dish for the Captain. Fan of a great steak this was just the ticket and the little pie didn’t stand a chance lasting long on his plate. 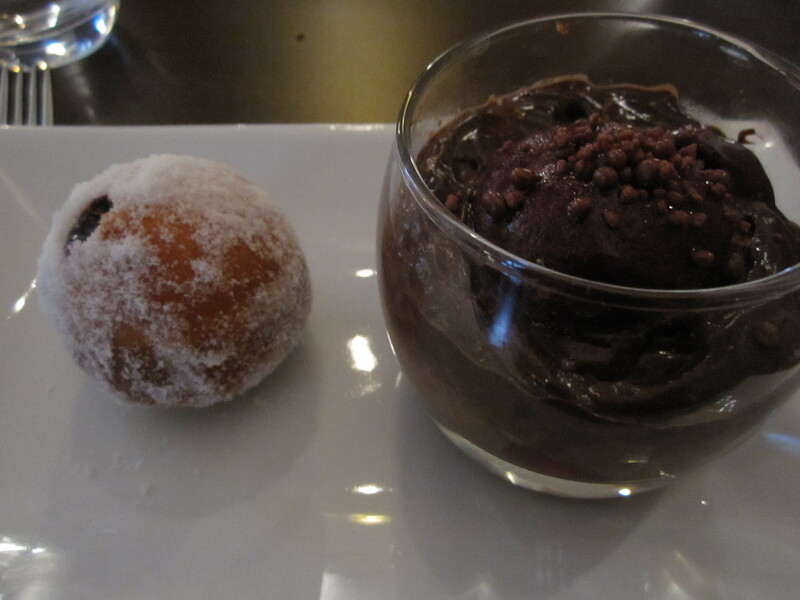 For me there was only one choice for dessert – the warm chocolate mousse, vanilla ice cream, cherry doughnut. But I’ll get to that in a minute. 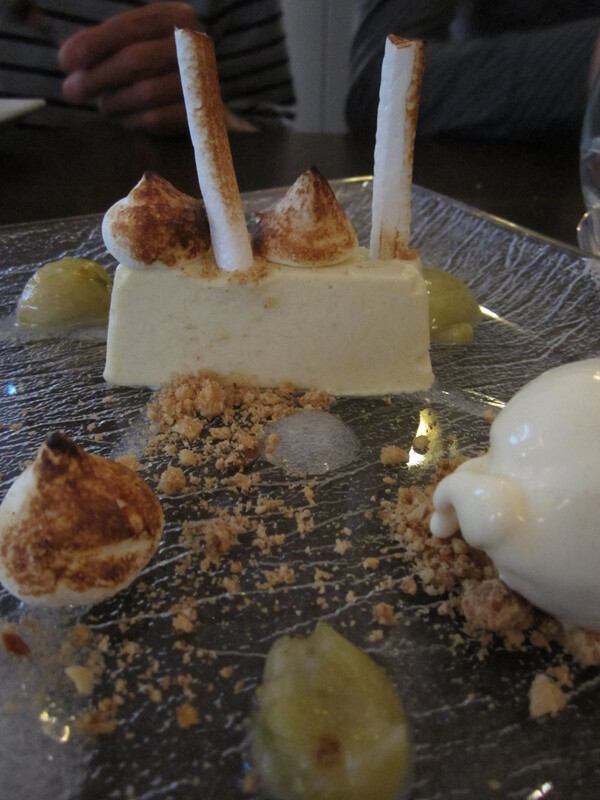 My mum went for a shocking non chocolate dessert ( the only one on our table) in the form of gooseberry meringue parfait with elderflower ice cream. Sharp but off set with the floral note from the elderflower. A great summer dessert. BUT, the rest of us lucked out on one of favourite desserts we’ve all had in a long time. The warm chocolate mousse – damn it was good. This would be the final dessert I would ever want. Words can’t convey the cloud like texture with the tiny surprises of popping candy and the warming chocolatey goodness. But if that’s not enough, we changed the vanilla ice cream for a perfect scoop of cherry sorbet on top, which pooled into the silky mousse. All decorum went out the window when the fresh cherry doughnut was tucked into and may…may of been dunked into the mousse. There are no words. Just go and try it.